Another mum at school said to me yesterday "I know you're a super-baker" (in the context of the conversation, she was snappy, but we both misinterpreted each other, so I ignored that bit). As I listened to her recount her story about why she's a terrible baker (she isn't, it's just the story she tells herself), I realised that there's lots of things you can do when you're baking that can impact the final result. So I thought I might share some tips for getting it right each time. 1 - follow the recipe. Whether it's a box or a piece of paper, that recipe is there for a reason. Follow it. The art of baking is actually science, chemistry to be exact. You need chemical reactions to make your products rise properly, so don't mess around with them. 2 - use baking paper in cake tins, not spray oil. Spray oil creates a crust on the cake as it's cooking, and isn't always easy to release from the middle of a tin. Save the spray for muffins, and smaller surface areas. 3 - whisk your dry ingredients together before using them. I only learnt this one recently, but it has really changed the texture of the finished goods. If any recipe calls for adding wet ingredients to dry (for example, muffins or a slice) give the ingredients a quick whisk first. A spoon will work, but not as well. The whisk breaks up ingredients and adds air to the mixture. 4 - use the best quality ingredients you can afford. I use homebrand products. I bake almost every day, so my budget doesn't stretch to the best of everything. But there are some products I don't compromise on, like white chocolate, and cocoa powder. 5 - know what you can substitute. I know point 1 says follow the recipe, but it is possible to substitute some things. If you don't have buttermilk, regular milk and vinegar or lemon juice will work. 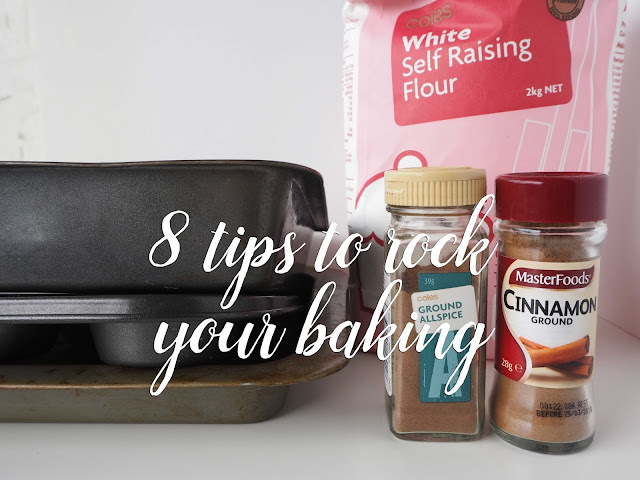 Don't have baking powder? Bicarb soda and cream of tartar will work together. Don't have self-raising flour? Add baking powder to plain flour. Need to use gluten free flour? Be careful, straight swaps don't always work, so do your research. 6 - play with flavours. If apple and cinnamon work well in the recipe, why not try pear and cardamom? You're not changing the base of the recipe (the flour, eggs, milk, etc), just the flavours that you're using. Honey and maple syrup can be interchanged; maple syrup is a slightly richer flavour, while honey is mild, and both react in a recipe the same way. Why not throw some chocolate chips into your next loaf of banana bread? 7 - know your oven. My oven doesn't work very well with two trays in it, so baking takes me longer (and roast potatoes are just a pipe dream!) one tray at a time. And it runs a little cooler than the knob says, so I have it slightly higher than recommended. Gas heats differently to fan-forced, and electric is different again. Get baking, and figure out where your oven works best. 8 - store it properly. There's nothing worse than reaching for a muffin to be met with a soggy top. Make sure your baking has cooled properly, so it doesn't sweat in the tin. Then store in an airtight container, in the cupboard. If you follow these tips, you'll be a baking pro in no time! What's your number one baking tip? These are great tips and would be super useful to new or non-confident bakers. I would add to your 'know your oven' tip to be aware which bits of your oven cook faster - even fan forced ovens cook unevenly and you can often get much better results if you turn trays around or swap their shelves halfway through a bake (depends what it is, but particularly for small cakes or muffins). We have started using dextrose instead of regular sugar at home and that's presented a whole new set of challenges as it cooks faster on the outside, so I now double line tins, and it needs more moisture in the mix, which has taken some practice. Mixtures often tend to be more doughy as well. Still, it's worth it for the reduced fructose in our diet, and it's certainly been a fun challenge! I think knowing your oven is the number one tip I would also share. I don't like baking, but with a child who requires a special diet, I have to do it!! If I had the ability to follow a recipe, I'm sure it would help. But that's why I stick to non-baking cooking, where rules don't matter. Your tips are all great, I also agree with Nicole Cox that knowing your oven is very important. I like I like that number 4. Makes sense, and I will be using this, thank-you! A great list. How good is the buttermilk substitute? I was so happy when I discovered that one. Buttermilk is so expensive otherwise and I only ever need a cup.